Tag Archive | "Cedar Springs Middle School Competitive Cheer"
The Cedar Springs Middle School Cheer teams competed at Sparta last week. The red team took first, and the white team (shown above) took 4th place. 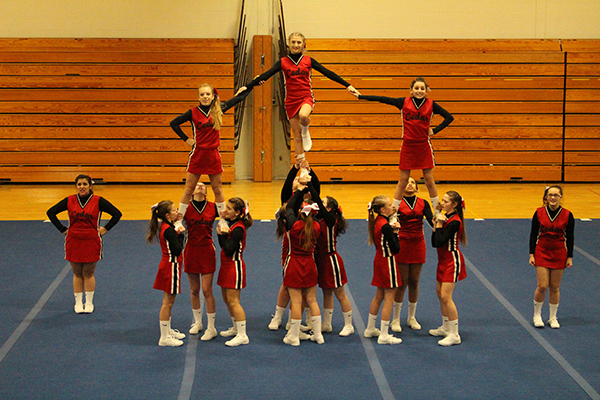 The second competition of the season brought the two teams representing Cedar Springs Middle School Competitive Cheer to Sparta where eight teams were competing for that 1st Place Championship. This week challenged the two coaches to be more creative with their routines. There were a few illnesses to the team that took out some of the girls. Routines were written and re written and the girls rose to the challenge with all of the necessary changes, including last minute changes right before competition. This effort shows the level of skill the coaches bring to the table and the talented girls we have to work with. After the completion of Round 2, Cedar Springs White earned a score of 76.74, taking 6th Place and Cedar Springs Red earned a score of 116.12 taking the lead with 1st Place. The completion of Round 3 earned Cedar Springs White a score of 214.1, bringing their total score to 290.84 and ending with a 4th Place overall. Cedar Springs Red earned a score of 259.2, bringing their total score to 375.32. This high score secured their 1st Place victory for the second time in a row. Congratulations to both teams and their coaches for a job well done! Let’s keep this winning season going. Our next competition will be held at Allendale Middle School Thursday, December 18 at 6 p.m. Come support a great group of girls doing what they love. These girls are doing a fantastic job representing their coaches, school and community.